Posted in: Entertainment, Travel on June 27, 2018. Southern Utah has been featured in a lot of films and television series. And as a result, we at the Lodge at Red River Ranch often get asked about famous filming locations. Which makes sense. People want to visit the awesome places that they’ve seen on screen. In the last couple of years, one series has been at the top of our guests’ minds – HBO’s ;. The show is about killer robot cowboys (more or less) that live in a recreation of the Old West. And where better to capture the Old West for the screen than Southern Utah? So we did some research, and found three easily accessible filming locations that are (fairly) close by. Check them out, and explore the real “Westworld” for yourself. Dead Horse Point State Park – you know all those exterior, establishing shots of the Mesa Hub building? (The central control building that’s situated on a cliff.) Those are all shot in Dead Horse Point State Park. In fact that’s where most of the canyon scenery of Westworld is shot. The “Man in Black” likes to hang out there and scalp people. The canyon below Dead Horse Point was created by the erosive power of the Colorado River – just like Canyonlands National Park and the Grand Canyon. In fact, because of their similar appearances, many people confuse images of Dead Horse with the Grand Canyon. The main attraction of Dead Horse Point is those incredible views, but there are plenty of hikes as well, some on the rim and some leading into the canyon. 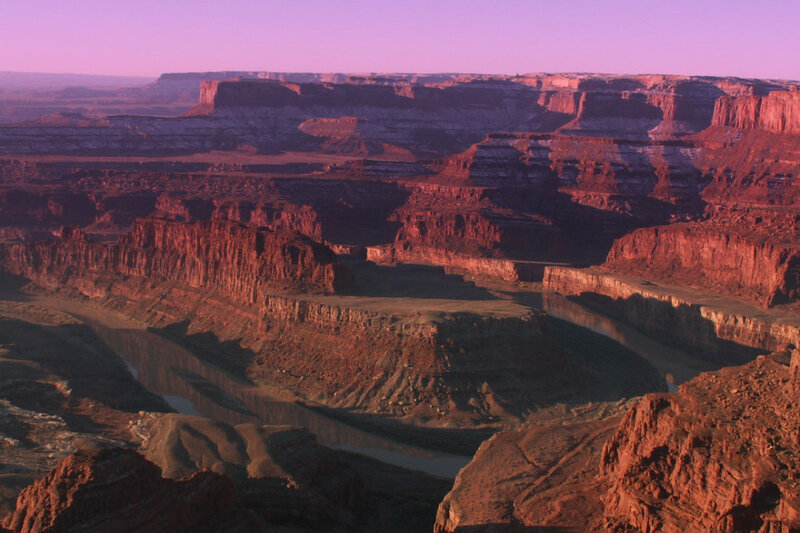 Check out this post for more ideas of what to do in Dead Horse Point State Park. Or visit the official website here. Castle Valley and Fisher Towers – a lot of those sweeping arial shots of sagebrush plains and towering red monoliths were filmed in Castle Valley and Fisher Valley. The vertical sandstone pinnacles of Castle Valley and, in particular, Fisher Towers make for a pretty dramatic backdrop. Which is why the locations were used not only for action sequences, but also to give the audience something to admire while the characters expound on the nature of the soul and whether or not any of us have freewill. Castle Valley is part of the larger geographic region known as the San Rafael Swell. The San Rafael Swell is famous for it’s unusual geology, vast canyons, and expansive wilderness. (It’s also where Goblin Valley State park is located.) See what to do in the San Rafael Swell here. 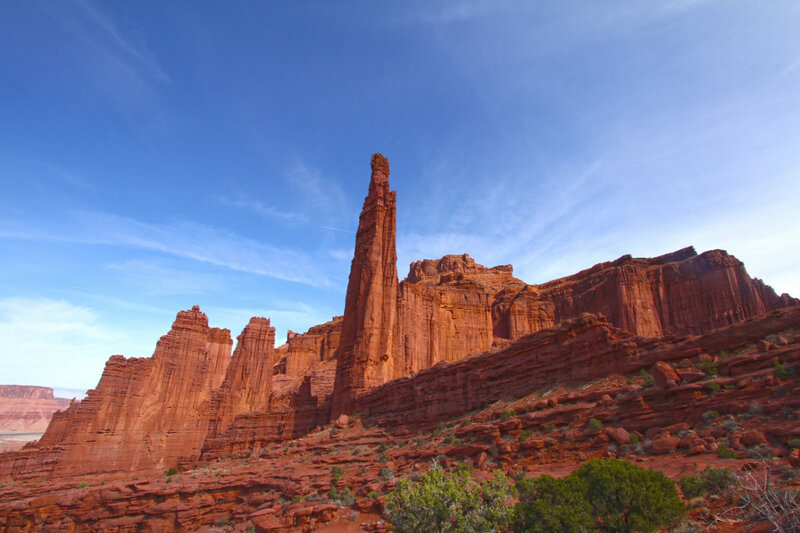 Fisher Towers is famous for another reason, it’s one of the most popular rock climbing destinations in the state. If you’re up for the challenge, the top of Fisher Towers will provide you with breathtaking views in any direction. Or if you’re not a climber, hike the Fisher Tower Trail. Utah State Route 128 – the Welcome Train that brings guests into Westworld was filmed entirely on State Route 128. The shots filmed inside the train were created by putting the actors in a train car set, putting the “train car” on a flat-bed truck, and driving back and forth along Route 128. 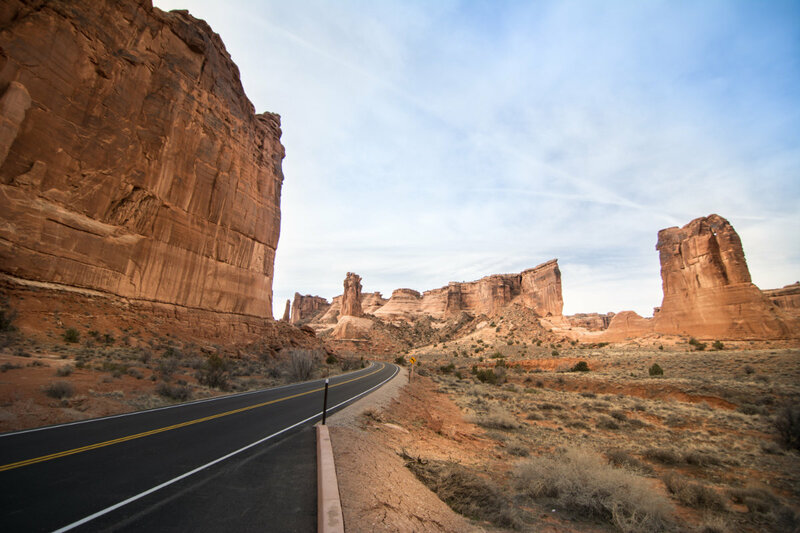 Located near Arches National Park and the town of Moab, Route 128 is one of the best scenic byways in the country. In addition to being a near-perfect roadtrip, Route 128 also provides access to Castle Valley and Fisher Valley. So you can check out multiple filming locations on one epic Westworld Vacation. That’s our list! Start with those locations to enjoy all the impressive views of Westworld, with none of the death or existential crises.